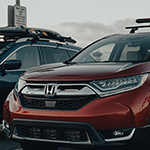 The 2019 Honda CR-V crossover is the epitome of versatility. With a modern interior and generous cargo space, the CR-V is built not just for taxiing kids to or from school, but also for weekend adventures and more. It proved its mettle on a one-day Sea to Summit Adventure Drive. The Trucks.com team, aided by a crew of outdoor enthusiasts, went surfing in the morning and skiing in the afternoon on a recent Southern California winter day. The goal was to see how the CR-V and two rival crossovers handled the diverse driving and gear-hauling conditions. Trucks.com pitted the Honda against the 2019 Toyota RAV4 Adventure and 2019 Nissan Rogue SL. After full-size pickups from the Detroit automakers, these three crossovers are the top-selling vehicles in the U.S. 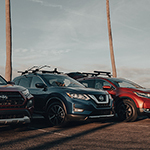 Roof racks from Inno, Yakima and Thule secured the surfboards, snowboards and skis for the journey from Huntington Beach, Calif., to Bear Mountain ski resort in the San Bernardino Mountains. The tested CR-V was an all-wheel-drive model with Touring trim. It came with a 1.5-liter turbocharged engine that delivered up to 190 horsepower and 179 pound-feet of torque. It has a smooth running, continuously variable transmission, one of the better such transmissions among automakers. Often they can be sluggish and whiny. The Touring trim comes with a leather interior, 18-inch alloy wheels and a nine-speaker audio system. It had Android Auto and Apple CarPlay and featured a power tailgate and LED headlights and taillights. A 7-inch, touch screen infotainment system provided access to climate control, device connections via Bluetooth and the radio. It also offers a reliable navigation alternative to anyone who doesn’t want to use Apple CarPlay or Android Auto. The tested Touring trim is the only CR-V in the 2019 lineup to feature built-in navigation. Cargo capacity immediately set the CR-V apart from the pack. The CR-V offers 39.2 cubic feet with the rear seats up, slightly less than the Rogue and about 2 cubic feet more than the RAV4. Fold the rear seats down and that grows to 75.8 cubic feet. That configuration fit two large snowboard bags, a surfboard bag, two duffle bags and two backpacks. Even with that much gear, visibility through the rear window and side windows remained good. The CR-V even had enough room to pop one of the rear seats up if needed for a third passenger. Its roominess wasn’t reserved for just the cargo area, either. Even with the Honda stuffed with gear, both driver and passenger had more than enough legroom to stretch out, and the lone rear seat wasn’t cramped. The backseat provided plenty of space for a 6-foot-tall person to ride comfortably, said Mike Soulopulos, a Laguna Beach, Calif., photographer. The center console area also is a spacious feature, with multiple cup holders and a sliding smartphone platform covering additional storage. A USB port is located within the console, offering Android Auto and Apple CarPlay connectivity. Leather seats, a wood-accented dashboard and modern infotainment system evoke a sense of luxury. Even its shift knob and steering wheel are wrapped in leather. “(The CR-V) is for someone who wants something that feels like a luxury vehicle at an affordable price,” said Caley Vanular, a snowboarder from Vancouver. But the vehicle isn’t perfect. The perforated upholstery of the seats becomes a trap for sand and dirt. Additionally, surfers will find that repeated contact with salt water will harden and wear the leather upholstery. That’s why the most active outdoor adventurers might opt for a synthetic leather surface if given the choice. Though it doesn’t have as rugged a body style as the Toyota RAV4 Adventure, the exterior of the CR-V still makes a compelling adventure vehicle. It has a minimum ground clearance of 8.2 inches and stands just 66.5 inches tall, making it easy to access roof racks. Installing racks is made easier by the CR-V’s low-profile roof rails. Drivers used a complete Yakima roof rack system, including towers, crossbars and the rack itself, to haul two snowboards the length of the trip. The Honda’s standard 18-inch alloy wheels and all-season 235/60 tires were more than capable on the drive, though the toughest condition encountered was packed snow. However, there’s no reason to believe that these tires, along with the CR-V’s all-wheel-drive, couldn’t handle a snowstorm or ice patches. The CR-V’s tow hitch and two recovery hooks on the front bumper — it was the only crossover with these — would have been helpful additions had the snow been deep enough to require digging out. The CR-V handled the dramatic change in driving conditions from the beach to snowy mountain roads with ease. Its responsive steering smoothly traversed the winding mountain pass of the San Bernardino National Forest, while its soft acceleration and braking helped navigate the dense Southern California traffic. Its driver-assist and safety suite are important features that provide drivers with extra security. It had adaptive cruise control, lane-keep assist and lane-departure warning, driver-attention warning, forward-collision warning, and a collision-mitigation braking system. Soulopulos liked the ease of driving with adaptive cruise control, which slows and speeds as traffic allows. The lane-keep assist was also gentle enough to not whip the crossover back into its lane should it detect a departure. It would softly push the CR-V back into its lane while allowing the driver to make the bulk of the correction. The 2019 Honda CR-V Touring AWD has an Environmental Regulation Agency rating of 27 mpg in city driving, 33 mpg on the highway and 29 mpg combined. Led by an abundance of available cargo space and a smooth, responsive drive experience, the 2019 Honda CR-V proved it’s more than just a family shuttle. 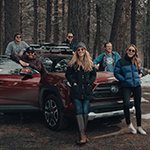 Its interior may not be able to take a beating like the Toyota RAV4 Adventure, but its capability to host a day of both surfing and skiing make it a highly versatile adventure vehicle.